Catholicism was virtually extinct in Surrey in the 17 and 18 Centuries as a result of the Penal Laws enacted during the reign of Elizabeth 1st. It was kept alive in a round the houses of a few landed families and the Westons of Sutton Place between Woking and Guildford were such a family. The Catholic Relief Act of 1791 had made it no longer a penal offence to say or hear Mass and some French priests exiled from their country during the French Revolution settled in the Farnham and Guildford area and freely celebrated Mass. In 1857 Captain Francis Salvin then owner of Sutton Place allowed his chaplain to celebrate Mass every Sunday in a room over a shop in Upper High Street Guildford. Thus was established the Guildford Mission. The first priest to minister to Guildford since the reformation was Fr. 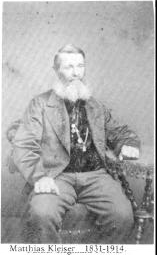 Joseph Sidden, son of the Sutton Place Land Agent. In about 1852 land in Chertsey Street Guildford was bought by Mr. Edward Collen of Albury acting on behalf of Cardinal Wiseman, as a site for a future church. The land, which was next to a dairy, included a small ale house fronting on the lane called The Bars and the licensee, a Mr. Chenery, was allowed to remain there for nearly 10 years before the church was built during which time he paid rent at £22 per annum to the Cardinal, Matthias Kleiser. Fr. Reginald Fowler was appointed parish priest in 1878 and given the task of building a new permanent church in place of the now old and inadequate hut. Mr. Ingress Bell was chosen as architect and Mitchell & Co of Shalford as builders were appointed to the task. The new church was built of Bargate stone, Early English in style with a seating capacity of approximately 200- 250. The church took 3 years to build and on 19th August 1884 Cardinal Manning officiated at a Pontifical High Mass to celebrate the completion of the church. However, the Parish borrowed heavily to build the church and it was not until 1901 that the debt was paid off and the church was finally consecrated on 12th June of that year. The Surrey Advertiser carried a detailed account of the long and unfamiliar Latin Service which was led by Bishop Bourne. Fr.Fowler was to remain as parish priest of St. Joseph's for 35 years when in 1913 he retired due to ill health. His long ministry included not only the building of the church but also a school and presbytery. He was a well known and popular man in the town with Catholics and non-Catholics alike. He continued to live in York Road Guildford until 1920 when he moved to a convent in St Leonard's on Sea for his final years. Fr. John Joseph Higgins took over from Fr. Fowler. With the outbreak of the first world war Fr. Higgins found himself involved in the settlement of refugees from Belgium and France. He was able to speak French and Flemish having spent some of his early life in Belgium. Fr. Higgins was a sick man when he left Guildford in 1919. It would not have been easy for any priest to succeed a pastor as well loved as Fr. Fowler. Fr. Higgins was a different kind of man being more reserved and less jovial. He suffered from gastric trouble and a weak heart. His doctor thought he had inhaled 'poisonous microbes' when ministering to soldiers who had been gassed. He died in 1923. Fr. George le Bosquet arrived in Guildford on 9th October 1919. His first task was to complete repairs to the church which were started by Fr. Higgins but interrupted during the war. In 1926 there were about 500 Catholics in the parish which included Merrow, Bellfields, Rydes Hill and Stoughton. In 1927 a mass centre was opened at Normandy, and one at Cranleigh in 1920. After a visit by Bishop Amigo to St. Joseph's on 14th November 1928 it was decided to start a fund for an extension to the Church. In 1931 Fr. Terence Fichter replaced Fr. le Bousquet but because of continuing ill health had to retire in 1935. Fr. Alex Hauber came to the parish that year and he carried out many alterations to the church including a new aisle so that more people could be accommodated. The outbreak of the second world war had its effect on the parish as did the First World War 25 years earlier. Four masses instead of 3 were celebrated on Sunday to avoid overcrowding and to facilitate evacuation in the event of a bomb attack. Mass was also said at Stoughton Barracks. Fortunately the church escaped damage during the war. Fr. Hauber had a long and happy stay at St. Joseph's until he was diagnosed as suffering from Leukaemia. He died in 1957. Fr. Thomas Hayes succeeded Fr. Hauber. During his time as parish priest decisions were taken to build a new church at Rydes Hill and Merrow and to transfer St. Joseph's school to the Rydes Hill site which had been purchased by Fr. Hauber. Early in 1960 a house called Dennfield in Eastgate Gardens was purchased by the parish to be used as a presbytery. This house is still in use today for that purpose. Fr Hayes recorded that he was "nearly driven mad by the continual clanging of bottles at the Dairy next door which started regularly at 4.30 each day." The schools were the biggest financial burden on the parish during the next decade with the new St. Joseph's school being built at Rydes Hill in about 1960 and later St. Thomas of Canterbury at Merrow. In 1970 Fr. Hayes retired and Fr. Patrick Cox came to St. Joseph's with the task of building a new church. Two problems faced him. One, finding a site for the new church, and secondly financing the project. 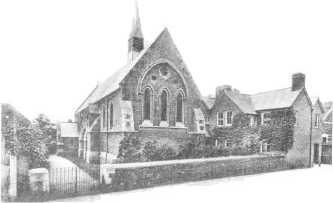 However, with the growing population especially in Merrow a new church, St. Pius X was built on land in the Merrow Grange convent school. The first Mass was celebrated there in December 1972. In the meantime, with space for parking becoming a problem at St Joseph's and the interior of the church in need of urgent attention a decision was made to sell the church site and rebuild on another site. After much negotiation the sale of the old church was agreed with Sun Alliance Insurance Company who erected offices on the Chertsey St. site. Negotiations followed with the Guildford Borough Council regarding the Chalk Pit in Foxenden Quarry for a site for a new church, and eventually a 199 year lease was agreed on condition that the car parking spaces be sublet back to the Council for municipal use. Construction began in Feb 1983 and for weeks there was very little to show because the ground works were extensive, and deep; over 80 piles were driven through the rubble that filled the pit and a great deal of hard work went seemingly unrewarded. This period was marred by the collapse of a piling rig which fell across the site, all 60 ft. of it with its 3 ton hammer. Fortunately no one was hurt. The building was designed by Richard Greening of Nye Saunders & Partners from Wonersh. The original contract time was 14 months but this turned out to be optimistic. The main contractor R. Mansell of Croydon, indicated that August would be the earliest completion date. Meanwhile Sunday Mass was being celebrated in the hall of the nearby Royal Grammar School, with week-day services held in a hall in Falcon Road. The new church was completed autumn 1984 and was consecrated on Saturday 8th September. It is of unusual design in red brick and with a very large roof span. The site is of splitlevel design and the church has been built on reinforced concrete pillars with car parking on the lowest level, the church hall next level and the church above that. Canon Cox having fulfilled his task of building a new church and also at retiring age left the parish to move to Selsey in 1985. Mgr. Timothy Rice arrived in June 1985, as the new parish priest for a new church facing a new era. However, Fr. Rice was diagnosed with cancer and died on 2Oth May 1988. Fr. Patrick Olivier, took over the parish and remained until 1996 when Fr. Peter Humfrey arrived. Under Fr. Peter, the parish grew and there were times when the church felt a little cramped. He proposed plans to increase the seating capacity. These plans have not yet been implemented. However, his proposal to glaze the church balcony so as to extend and increase the total useable space in the hall was put in hand and was completed in 2001. Sadly Fr.Peter left in 2001 and Fr. Ian Byrnes became Parish priest with Fr. Charles Howell as assistant. 1857 – 60 - Joseph Sidden, R.I.P . 1860 – 64 - Edward Clery, R.I.P. 1864 -- 65 - Thomas Richardson, R.I.P . 1865 -- 78 - Edward Sheridan, R.I.P . 1878 -- 1913 - Reginald Fowler (lst Missionary Rector), R.I.P. 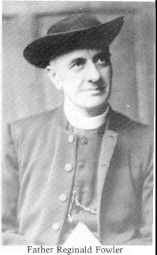 1913 -- 19 - John Higgins ( 1st Parish Priest), R.I.P . 1919 -- 31 - George Le Bosquet, R.I.P . 1931 -- 35 - Terence Fichter, R.I.P. 1935 -- 57 - Alexis Hauber, R.I.P . 1957 -- 70 - Thomas Hayes, R.I.P . 1970 -- 85 - Patrick Cox, R.I.P. 1985 -- 88 - Timothy Rice R.I.P. 1931 -- 36 - Francis Gilfillan R.I.P. 1936 -- 38 - Ronald Pepper R.I.P. 1938 -- 46 - Ambrose Woods R.I.P. 1946 -- 52 - Thomas Sheehy, R.I.P. 1958 -- James O'Carroll, R.I.P . 1958 -- 59 - Michael Carroll, R.I.P . 1959 -- 66 - Patrick Battishill, R.I.P . 1971 -- 74 - Peter de Ath R.I.P.